Site: Plant lemon verbena in a sunny area within sheltered site to protect against frost. Prefers a neutral pH and good soil drainage. Growing: Thin or transplant to 3 feet apart. It makes a good pot plant. Prune dropping branches to encourage new growth in autumn. Grow indoors in winter (don't worry if it drops its leaves). Prune and spray with warm water in spring to revive the plant. Harvesting: Pick leaves anytime, but it is best when flowers begin to bloom. Culinary Uses: Finely chop young leaves for drinks, salads, fruit puddings, confectionery and apple jelly. Use sparingly. 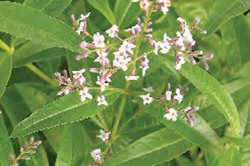 Lemon verbena has an intensive aroma of lemon. Crush lemon verbena and mint leaves for a refreshing mint and lemon tea.